It’s been five months since Link’s Capitol Hill Station opened. Can you feel the difference? Everyone is walking towards the station. Bus stops around it seem emptier in the morning. Train cars keep getting more full. We’re so caught up learning to dodge bicycle tires and stay upright on swaying trains, perhaps some of us already forgot that the 10 used to run to Pine Street on 15th. The 10’s reroute is linked to the return of rail service to Broadway for the rest of time. This view below from 1970 strains to look back to the end of Capitol Hill’s original rail service. The coach pictured here was Seattle Transit #615. That bus was purchased in 1940, the year after Seattle Municipal Railway was rechristened Seattle Transit and embarked on the destruction of the streetcar system. Seattle Transit purchased 100 coaches from local company Pacific Car and Foundry (now PACCAR) and 135 from Twin Coach. There just aren’t as many gas stations as there used to be. The economics have changed. People drive less, cars use less fuel. I looked through the 1931 city directory. There were at least 33 gas stations on Capitol Hill back then. There were so many more no matter which way you drove: on Eastlake, on First Hill, in Madison Park, at Portage Bay, on Westlake. Today Capitol Hill, Broadway, Pike/Pine, heck you can go way out Madison and there are still only seven stations. In 1990, the Seattle Times ran an article about a new law requiring gas stations to carry insurance against environmental damage. Before that law took effect, they reported there were already only half as many stations as in 1974. Even more closed afterwards. And they keep disappearing. Recently I was going through my old photographs and found this look down at Pine and Broadway in 2000. I’ll be honest, I have no memory of this Chevron. I remember it as a lot surrounded by chain link and then at last the Walgreens and Capitol Hill Housing building we have now. (If you have better memory of the station, leave a comment!) I’m pretty sure the station at Pike and Broadway is living on borrowed time. The land is too valuable as a people-oriented use. This is the Ward House, seen in two of the three locations it’s been over the last 120 or 130 years. The bottom half is at Pike and Boren on the southwest corner, seen in the early 1890s. The top half is earlier this week, at Denny and Belmont on the northwest corner. Between the two it was nearby its origin, turned and moved a bit up Boren to make way for the Gallatin Hotel in 1905, and stayed there until it shuffled uphill in 1986. There are many ways to tell the stories of the secret lives of buildings. The way I like to do it, I start with a crisp date of construction and tell a bit about Seattle and the neighborhood at that time. Then I share how the humans responsible for it lived their lives and whether they were notable, or just notably normal. The Ward House’s early story is more difficult to piece together than I expected. 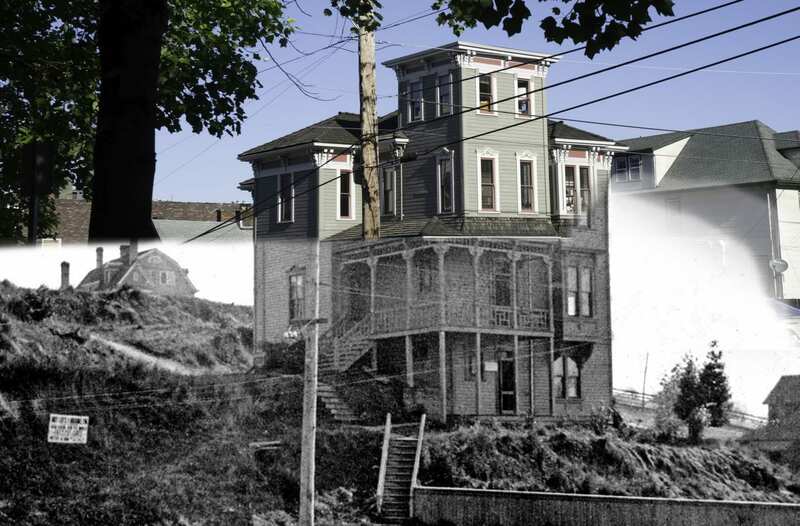 Especially since it’s one of Seattle’s earliest official city landmarks, and because has been known as Seattle’s oldest surviving home. Luckily I had some help, but there is plenty of fertile ground for the next historian to hop to it.